The Breakdown: Will Congress Limit Carbon Emissions? Christopher Hayes asks environmental reporter Kate Sheppard whether it's still possible for this Congress to pass a cap and trade bill. With Republican Lindsey Graham abandoning his own climate change bill, Alaska's Lisa Murkowski gaining some Democratic support in her crusade against the Environmental Protection Agency, global temperatures still rising and thousands of gallons of oil still gushing into the Gulf of Mexico, is it still possible for this Congress to pass some kind of cap and trade bill limiting carbon emissions? 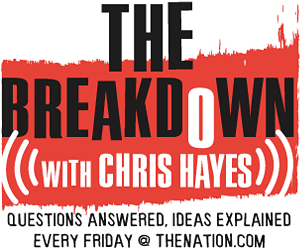 Kate Sheppard, a reporter on environmental issues for Mother Jones magazine, joins DC Editor Christopher Hayes to answer this question on this week's edition of The Breakdown. With Republican Lindsey Graham abandoning his own climate change bill, Alaska’s Lisa Murkowski gaining some Democratic support in her crusade against the Environmental Protection Agency, global temperatures still rising and thousands of gallons of oil still gushing into the Gulf of Mexico, is it still possible for this Congress to pass some kind of cap and trade bill limiting carbon emissions? Kate Sheppard, a reporter on environmental issues for Mother Jones magazine, joins DC Editor Christopher Hayes to answer this question on this week’s edition of The Breakdown. More about our guest, Kate Sheppard. More information on climate legislation from Grist staff writer David Roberts.